The annual “Hearts United Against Hunger” food drive at Shelter Rock School resulted in a donation of 1217 non perishable items to stock Dorothy Day’s shelves. First graders won the competition with a mighty total of 311 items. 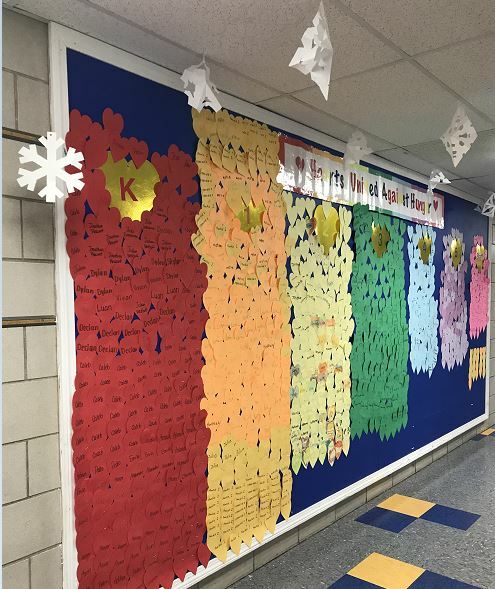 Each paper heart represents a donation and each color represents a different grade level. Special thanks go to Principal Anna Machial, her Administrative Assistant Jeri DiFronzo and the custodial staff for a job well done. Overnight shelter volunteers and shower volunteers needed!! See "volunteer" page for details. Dorothy Day Hospitality House serves 60-80 hot meals each afternoon and provides shelter to 16 people each night. If you are in need to a meal or lodging, please click "if you need help" on left.